If there’s one thing that I absolutely love to do, it’s trying to capture car trails after dark in different environments, all over the world. I have taught many classes after dark and whether it’s shooting the Milky Way or star trails, light painting or capturing lightning, or so many other things, capturing the lights from car headlights and taillights in different locations is one of my favorite things for sure. 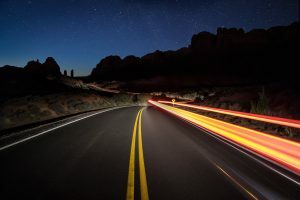 I’m always trying to find new ways to capture great car trails and with a little forethought and creativity – and of course the right gear – the sky is the limit. As far as gear, a good tripod and a nice fast wide-angle lens is pretty much all you usually need. For almost every image in this article, I was using either the Really Right Stuff BH 55 or BH 40 ballheads. I cannot live without these ballheads, as there is really no substitute. I also use and have on every camera a RRS L Bracket. This is a quintessential piece of gear that I have every single student purchase, and it works seamlessly with their fantastic ballheads. When I am traveling far away, I love using my RRS TQC-14: Quick-Column Series 1 Tripod as it is small, lightweight, and perfect for travel photography. Having the right gear is one thing, but finding the right location and pre-visualizing the final outcome that is in your mind’s eye is the real work. As a travel photographer, I encounter an amazing variety of opportunities, and when I see a scenario with potential it’s always super exciting! In the photo above, I wanted to try something different with one of my students who was in an after dark class in Los Angeles with me. We went to downtown LA after a Laker game let out so that there would be a ton of cars going both ways. I wanted to create a Star Wars warp speed effect and try something that I had never done before. Delkin gave me a new suction cup system for cameras and I decided to attach the camera and my Canon superwide 14mm to the suction cup and place it in front of my sunroof outside my car with a cable release hanging next to the steering wheel. I could trigger the shutter while driving as my friend held on tightly to my camera strap in case the camera decided to fall off my car. I took a guess on the that speed I should have be driving at around 10mph, and the shutter speed of my camera, which I set at five seconds, and I was pleasantly surprised with the image above. I don’t usually photograph while I’m driving, but I wanted to try something different and I love thinking outside of the box. 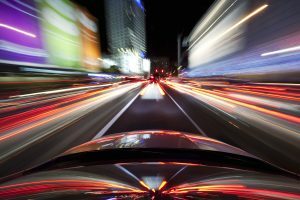 Typically, when you’re shooting car trails, you’re looking for a location that is either more remote to really accentuate the car trails or a scene that has a lot going on. In the image above, I was in Arches National Park scouting out a workshop with my buddy Larry Lindahl and we found ourselves on a pretty desolate road. With no cars to give us our car trails, I asked Larry if he would drive my Mazda during the exposure, and I would fire both of our cameras. Some cars give terrible car trails and some are fantastic – my Mazda has excellent rear lights. I set my tripod and camera in the middle of the road and guessed that it would take him about 30 seconds to get to the final bend where he would disappear. Using my Canon 5D Mark IV and my 16 to 35 vIII f2.8 lens, I set the camera to f/11 and ISO 2000. I wanted good depth of field, but I also wanted to try to get some stars. Blue hour had begun and I figured this exposure might work out; it turned out to be just what the doctor ordered. You have to play with your exposures as the sky quickly changes from the blue afterglow to the black of night, so you have to constantly check the LCD screen. Pro Tip: If possible, time a car driving through your image from the beginning until they are out of view. This will give you a good idea of your shutter speed. As I said earlier, pre-planning is a big part of capturing a great scene involving car trails. 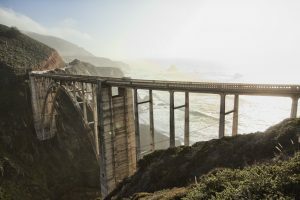 In the image below, my wife and I scouted out the Bixby Bridge, which is by Big Sur in Northern California. During the day, I found the exact location where I wanted to be standing that night and also what lens and focal length I wanted to use. This helped a bunch so I would know exactly where I should stand and have my camera for later that night. In the final image below, you can see that I waited until it started to look yummy…. when things were looking beautiful from the exact same vantage point from hours before, I set up my tripod once again with my cable release and this time with my 16 to 35mm lens set at 25mm. I timed how long it would take the cars to go from one edge of the bridge all the way to the other and out of my sight. It ended up being close to 15 seconds so I set my shutter speed to 15 seconds and then my f/stop to f/22, but I also changed my ISO to 50 to get the least amount of noise as possible from my camera. 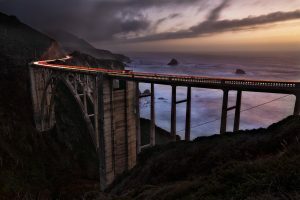 It was actually almost impossible to get cars going in separate directions at the same time since there was such little traffic on this bridge on this particular night. So, I shot cars going away from me and capturing their taillights and then I shot the other shots with cars coming towards me with their headlights. Later in Photoshop, I layer masked the two shots together, one with the cars coming and one with the cars going. This was exactly what I wanted, although capturing just car taillights would have also worked very nice but I really wanted headlights and taillights in the final photo. Sometimes, I decide to leave with my wife Holly to go and shoot nighttime shots in a great city like Las Vegas or San Francisco that has so many opportunities after dark. On one of my trips to capture San Francisco after dark a while back, I shot Lombard Street the way many people probably do – from above. The image below shows that vantage point. I set my camera at a 30 second exposure at a small aperture and I was standing on a lamp post and managed to get my tripod legs close together so that I had a higher vantage point. Although I had shot from all over the place, even in the middle of Lombard Street halfway down, this vantage point was pretty impressive. I wasn’t really satisfied with this location, as I wanted something completely different, and I went to scout out different viewpoints to capture the infamous Lombard Street from a different angle. I decided to take my 500 mm f/4 and my tele-converter and went with Holly to scout out some different vantage points one afternoon. From about a mile away on Lombard Street, I decided to pull over and see what it might look like to capture this incredible street with a super telephoto. 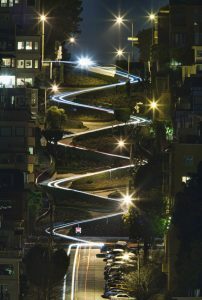 I could see in the distance the curves of Lombard Street and knew that I might be onto something so I pulled over and I ran to the middle of the street with my tripod and 500 mm lens with my 1.4 tele-converter attached. I could not believe what I saw, and knew that I had finally found the vantage point I had been looking for. I knew that we needed to come back later that night, and that’s exactly what we did. With Holly in the car once again, we had to double park as parking is crazy everywhere in San Francisco. I set my tripod up in the middle of the street from that spot about a mile away and captured the image below. Buses kept coming down every couple of minutes and I had to keep moving my tripod to the side of the road but as soon as they would go by, I would be back in the middle of the road with my tripod, camera, and cable release. 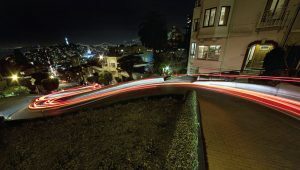 A 30 second exposure was just what was needed to capture the cars coming down from top to bottom as they were going about 5 miles an hour on the windy road of Lombard Street. Usually shooting around f/11 or f/16 in a situation like this will give you just what you need and of course a low ISO around 100, if possible, is also where you need to be. 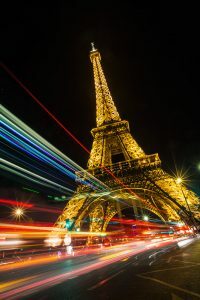 This was one night I will never forget, as I had never seen an image shot like this before and I was so happy to capture something completely different and unusual in one of my favorite cities in the world! Deciding on locations is the toughest part of capturing car trails, and sometimes street-level is best and sometimes high above the skyline is best. The next image shows what a high vantage point can reveal for car trails and I scout locations like this all over the world. While I was in Dubai, before starting a workshop in India a few years ago, I was able to shoot from my friends’ condominium overlooking my favorite intersection on the planet. But this time I decided to try something different and was not sure how it would come out. I wanted to try a nighttime panorama with car trails. I knew I would have to shoot quickly and my Really Right Stuff PC-LR Lever-Release Panning Clamp was absolutely a necessity. Since the Burj Khalifa, the tallest building in the world, was directly in front of me and even though I was shooting vertical, I knew I needed a super wide lens to not cut off the top of it. I put my Canon 11-24mm vertically on my RRS L Bracket and RRS pano head and decided on 13 seconds for each piece of the panorama. I shot from left to right, a total of eight exposures, but only used six in the final panorama. 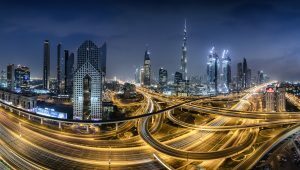 I was at F/18 and an ISO 200 for each 13 second exposure and although the amazing Sheikh Zayed Road is in reality completely straight, the resulting curve added to the overall impact. With all kinds of light sources in your images when shooting car trails amid architecture, I usually start out with auto white balance. It’s a good starting point to see how the color temperature is looking overall. In this last image above of the Eiffel Tower, I once again wanted to try something different. I was with one of my best friends who lives in Paris, Saúl Aguilar, and he and I always try capturing different things while I’m there. I absolutely love capturing all kinds of trails from vehicles, not just cars, and some of my favorite trails are from buses and huge trucks. We walked towards the Eiffel Tower and realized I had found the perfect vantage point where buses drove right next to the sidewalk. We set up our tripods with a perfect vantage point of the Eiffel Tower in the background and knew we had hit pay dirt! Although I prefer shooting during the blue hour if possible, we had been out shooting all night and even with a black sky, I love how this image turned out. Images like this are fun and a great way to push your photography skills as shooting after dark can be much more difficult than shooting during the daytime… but it can be incredibly more rewarding! You can shoot from high above in beautiful cities like Dubai or get great car trails from street level, as in the Eiffel tower image above. Just keep those those eyes peeled and look for great scenarios that will work after the sun goes down. I hope that many of you get to try shooting different things after dark as it really opens up whole new world for your photography!! 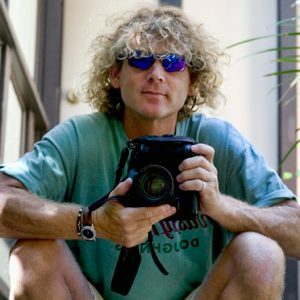 Scott Stulberg is a world-traveling photographer and instructor and leads photography workshops all over the globe, His images are represented by Getty and in collections worldwide including the United Nations. You can see more of his work and his photo workshops on his website at asa100.com Words and images ©2018 Scott Stulberg. All rights reserved. Thanx so much for the nice comments! Yes, so much pre-planning is involved in making these images but the pay off is worth it! Love shooting so many things after dark and it is your gear that helps me so often in the field. Glad you like the Dubai image as I was not sure how it would stitch together with such a wide pano view from so many stories up but it sure worked! As I tell my students so often; not sure what life would be like without RRS! Scott – I very much enjoyed your pictures. I agree that the planning and visualization is so important. I have not made these kinds of pictures yet, but you have inspired me to get going. I shoot a lot of nature photos and waterfalls. I am waiting for my RRS L bracket and it could certainly be useful for these types of pictures too. I have one question. I noticed – or did not notice – any red lights in the Dubai picture. It appears to be only headlights. On such a big road with much traffic how did you manage to only have headlights? Glad you enjoyed the article. Always a lot to think about when you’re planning and capturing car trails but it’s definitely worth all the effort. Happy that I could give you a little inspiration as this is a totally different animal to capture. And your RRS L Bracket is one of the best things that you could purchase for your camera without a doubt. I really can’t imagine shooting without one. As for that question on not too many red taillights in the photo. So, they are in the picture but sometimes they’re not as prevalent as in other car trail images. So they are there but a little faint…. and if you do something in a different location, you might see more red car trails than headlights…. as I prefer actually in many of my images. Have a lot of fun out there!! A lot of preparation but definitely worth the pay off!! I’ve always wondered how to capture car trails after dark, thanks for the info. very nice work. I shoot car trails a lot too. Its a very rewarding experience when all of the planning and prep work come together in a great image. I’m very satisfied with my RRS BH-55 Ballhead, I need to get a new Lens Collar my Nikon 80-200mm f/2.8D AF-S and RRS doesn’t;t make one. Does anyone know if a Kirk NC80-200 Lens Collar will take a Nikon D850 RRS flat (not L) plate?